National Gallery of Modern Art, New Delhi, (NGMA) will organize first edition of 'Night at the Museum' on 30th January 2019. 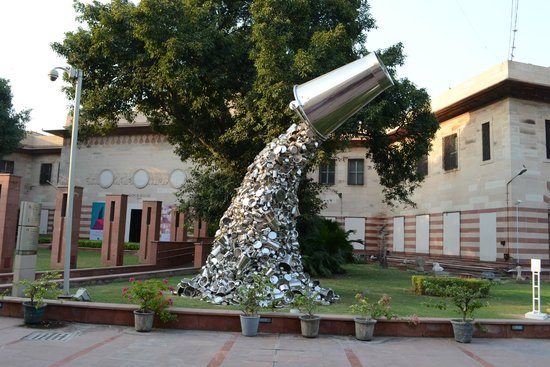 The first edition of this event is organised in collaboration with the India Art Fair from 8:00pm to 11:00pm. NGMA shall conduct guided tour of its prestigious permanent collection which is on display at the permanent gallery. Highlight objects include works of art of Amrita Sher-Gil, Rabindranath Tagore, Raja Ravi Verma, Nandalal Bose, Jamini Roy to name a few. Visitors would also get an opportunity to view special exhibitions entitled Roopantar an exhibition of sculptures from the treasures on NGMA and Dandi Yatra an exhibition that pays homage to the iconic Dandi March. NGMA aims to conduct Night at the Museum as a regular activity and organise it on the last working day of every month. This article is about the institution in India. For other uses, see National Gallery of Modern Art (disambiguation). The National Gallery of Modern Art (NGMA) is the premier art gallery under Ministry of Culture, Government of India. The main museum at Jaipur House in New Delhi was established on 29 March 1954 by the Government of India, with subsequent branches at Mumbai and Bangalore. Its collection of more than 14,100 works includes works by artists such as Thomas Daniell, Raja Ravi Verma, Abanindranath Tagore, Rabindranath Tagore, Gaganendranath Tagore, Nandalal Bose, Jamini Roy, Amrita Sher-Gil as well as foreign artists, apart from sculptures by various artists. Some of the oldest works preserved here date back to 1857.With 12,000 square meters of exhibition space, the Delhi branch is one of the world's largest modern art museums.